This is another post in my marathon training series…hope it’s useful! One of the key parts of marathon training is the long run. It’s pretty much what differentiates marathon training from other more conventional races, like half marathons and 10ks (I say more conventional races as there are some crazy races like ultras and obstacle races as a whole different ball game when it comes to training of which I have next to no experience with). With half marathons you don’t really need to go above 12 miles during training, some plans don’t even go above 10. If you’re quite experienced you might go over the distance, say 14 miles, but higher than that isn’t really necessary. But for marathons you’re looking at 16 miles becoming a medium run and potentially 24 miles as your longest. Personally I’m happy if I can hit 18 miles three times. I might venture up to 20 or above if I’ve got a race I can use but I wouldn’t ordinarily just go out on my own for 20 miles. It’s really your personal preference. If your new to marathons and you’re scared you won’t make it, then doing a 20 miler might help squash some doubts and give you confidence. If, like me, you’re a bit injury-prone, then doing many 18 miles and above long runs might be tempting fate a bit too much. I would always recommend doing your last and longest run three weeks before your marathon – just before you taper. That way you give your body three weeks to recover from that run and become nice and fresh for the race. In those three weeks you’re not dropping the ball though and doing nothing. Your mileage should decrease but the intensity should remain fairly similar. For example, if you always do an interval session on a Tuesday night, just because you’re tapering doesn’t mean you can’t still do it. During tapering your runs shouldn’t all be easy plods of minimal distance. For me I find doing a long run of 14-16 miles two weeks out and then 10-12 the week before the race works nicely. It keeps my body ticking over but not exhausting it. My other runs during the week stay the same. Obviously when you begin marathon training you don’t suddenly bash out an 18 miler though, it’ll take a fair few weeks. And you may find you run 14 miles and wonder how the hell you could possibly run further. But you will, you’re body adapts as you increase the mileage slowly. Next week you might do 15 and it feels similar, but you’ve just run one more mile than last week. I still get nervous the night before a long run. It’s silly because it’s just running. But there is something quite nerve racking about running a long way, especially if you’re venturing into a distance you’ve never run before. A way to help reduce those nerves is to plan well. Get your route sorted, organise what clothes you’re going to wear (what’s the weather going to be like? ), make sure you’ve had enough to eat and enough sleep the night before, sort your fuel out (are you taking gels? Are you having breakfast?) and hydrate well the day before. To calm myself I tend to run the route in my head. For some reason it helps chill me out. I will always plan my route for a long run. I hate going out and not knowing where I’m going or only having a vague sense of the mileage. I like to set off on a predefined route and shut my mind off from it, let my legs do the running and just relax into it. I tend to use RunKeeper to plan out a route. There are lots of other sites and apps you can use (MapMyRun for example) but I like RunKeeper. I click ‘Create your own’ and just plan it out from there. You can follow the roads easily by clicking on them and it’ll tot up the distance for you as you go. The advantage of MapMyRun is that you can have a look at the elevation whereas RunKeeper doesn’t. But for most of my long runs I run them around the same area so I’m familiar with the hills. I’m very lucky in that I love running on my own. I have no issues with running all my long runs solo. The advantage for that is at the end of the day I will be running my own marathon. I won’t have someone to chat to or help battle through the miles with on the big day. I’ll be running with other people in the race but that’s different. I also have full control over the pace I want to run, where I want to go and what time I leave. I do of course enjoy running with other people but for most of my long runs I like to be in control. If I stop it’s because I need to stop, not because someone else does. It’s highly selfish I know but at the end of the day I run marathons for me and no one else and being so injury-prone (and a self-confessed paranoid runner) it helps me relax a lot more to know it’s only me I’m letting down if for some reason I can’t carry on the run or that the pace isn’t right. That said, so many people in my club run on a Sunday together for their long runs and love it. And the long runs I’ve been on with other people have been a lot of fun with good banter and the miles fly by. There’s absolutely nothing wrong with running with others if you find it helps you. But for me personally when I have a marathon I really want to do I know I need to be sensible and keep my head in my own game. I also need to ride that pain train on my own, because on marathon day I’ll be on my own and I need to know I can cope. This is different though when I decide to run a race as part of a long run. Not necessarily to race it but to help break the monotony of solo long runs and to also have a nice catered long run (aid stations and cheering are always welcome!). And you get a medal… Last year I ran 12 miles and then finished it with a local 10k race, I also ran 5 miles to a half marathon. It does require a fair bit of time management to get it right though! It’s advised that the pace you should run your long runs should be a minute to a minute and a half slower than your goal marathon pace. This is to avoid knackering your body out, especially if that pace is quite a tricky pace to maintain. As you continue training that pace will become easier, but initially you need to slow it down. It’s about time on your feet, not how quickly you can do it. I struggle a little with this (and when I say a little I mean I kind of don’t follow it at all). I think this is mainly because my marathon pace is generally a pace I can readily achieve in normal life anyway. When I’m running regularly my marathon pace tends to be an easy pace for me (it’s anywhere from 7.45min/miles to 8.30min/miles depending on what shape I’m in). On long runs I don’t look at my watch that often and just run how I feel. Perhaps I should force myself to slow down but so far it’s worked fine. For getting my PB last year at Liverpool I ran most of my long runs around 8 min/miles and then ran the marathon around 7.45min/miles. The marathon itself was comfortable for 80%, where the last 20% was tough but doable. I would hate to run all my long runs at 9min/miles and then suddenly expect my body to hit 8min/miles on the day. But that’s just ME. I don’t run a huge amount of miles during the week (30ish) and I don’t do a whole lot of speed work. It just works for me. You need to work out what works for you. If you find you’re absolutely broken and exhausted for the following week after a long run then perhaps you do need to slow it down. But if you feel comfortable fatigued (that lovely post-long run haziness that doesn’t hugely impact your day-to-day) then you’re fine. Like I said in a previous post, it’s not rocket science but you do need to think about it. I became a little reckless and carefree last year the night before a trail marathon and had an Indian curry that I’ve never had before. I’ve had Indian food before long runs quite a lot but this was a spicy curry I wasn’t familiar with and I thought I would be absolutely fine. “Stomach of steel” I laughed as I chowed down my second portion. During the marathon I had to stop twice for an upset tummy. It wasn’t pleasant and I learnt my lesson in a big way. Always respect the marathon. Marathon training is hard work and you do have to sacrifice things (going out for dinner or a late night at pub before an 18 miler isn’t always a great idea). Don’t suddenly try something different the night before a long run. Obviously you do need to test different things out but don’t be silly about it. If you know pizza works nicely, eat pizza. I generally have an Indian takeaway most Saturday nights before a long run. I adore Indian food and I love getting a takeaway as I cook all week. It’s a nice treat I budget in for and fits my lifestyle (sad, lonely woman – joke!). But I know exactly what to have from my Indian – mainly chicken, no thick sauces, poppadums and salad. Nothing crazy but I love it and I run well on it. And you need to work out if you need to take fuel with you on the run – whether that’s gels, sweets or ‘real’ food like dried fruit or cereal bars (questionably ‘real’ food). I don’t take anything with me but I generally have three gels during a marathon (that way I get the maximum boost on race day as my body has trained without them). I already know what gels work with my system so I don’t need to test them out on a long run, but if you’re unsure you should always try before the big day. Some people’s stomachs can’t handle gels. And also you need to work out how you’re going to carry them: in a belt, in your hands, have someone pass them to you or depend on what the marathon has to offer. Most marathons will state if they’re providing fuel and what that fuel will be so you can train accordingly. Don’t fret and panic. Long runs are a dress rehearsal not the main event. If you struggle and have problems during these runs than that’s ideal as you can solve them before the big day. Better to get your problems and worries done early so the actual marathon is just a celebration of the hard work you’ve put into it. And if you miss a long run because of illness, injury or holiday, you’re not going to fail. It’s not an exact science and as long as you’ve gotten in some solid mileage during the entire process you’ll be fine to miss a few runs here or there. No training cycle is perfect. How do you prepare for your long runs? Do you pre-plan your route? What meal do you have the night before a long run? First topic surrounds one of my favourite things (other than running): FOOD. When it comes to food and marathon training I think it can get over-complicated and confused. To be quite honest, if you’re a regular runner or do regular exercise then really not a huge amount needs to change straight off the bat. You don’t suddenly need to be eating pizza every night and gulping down a protein shake to get through the day. Ideally as you gradually increase the miles each week then you should also gradually increase your calories/fuel as well. This is especially true if you’re trying to lose weight (I’m not, don’t worry!). Just because you added an extra few miles onto your usual run at the weekend doesn’t mean it’s time for a second lunch. That being said, as the miles do get substantially bigger and you suddenly find the day after a long run you are rungry ALL THE TIME then sensible snacking can help immensely. As you probably know I’m a huge fan of protein. Personally I think a snack that’s high in protein is fantastic because not only is it quite satiating but it’s also great to help towards muscle repair. Running takes a lot out of the body and protein can really help build back up the muscles. Cottage cheese – this might sound a bit odd but cottage cheese is a fantastic, tasty snack. It’s high in protein and low in fat and sugar. It’s a good source of calcium and selenium (a good antioxidant). Have it plain or add in some berries and some seeds and suddenly you have quite a well-rounded snack with protein, carbs and fat. I take a little Tupperware box with me to work and eat it like a yogurt in the afternoon. Nuts – pistachio nuts are a regular snack for me at work. I prefer them to other nuts as they’re a bit harder to eat as you have to de-shell them. This means I’m less likely to mindlessly power through a bag of them. Nuts are high in calories but they’re a fantastic source of protein and ‘healthy’ fats. If you have more self-control than I do, other nuts are also just as good. Meat jerky/biltong – OK not exactly a ‘normal’ runner’s snack but I love these. Just make sure you get good quality that’s not full of sugar and strange chemicals. It’s super high in protein, while low in carbs and fats. Icelandic-style yogurts – they taste just like normal yogurt though they’re a lot thicker. They’re low in fat and sugars but really high in protein (something like 11g per 100g) and contain all the good probiotic magic too. There are flavoured ones too but they’re usually full of sugar so I’d recommend just throwing in whole fruit instead. Fat, like protein, is very satiating and shouldn’t be feared. It’s an important source of nutrition for our body, helping contribute to healthy hair, skin and nails and also hormonal function and reducing inflammation. Just avoid trans fats as they’re the nasties that can mess around with your system. Hummus – pair with some vegetable crudités or some wholemeal crackers and you’re good to go. A great source of fat from the chickpeas and olive oil. Avocados – the star of Instagram posts all over the world, mash onto a rice cracker (preferably a wholegrain one to bump up the fibre and satiety factor). It’s a great source of potassium (more than bananas!) and monounsaturated fat. Cheese – avoid processed rubbish (though I’m always partial to Babybells as they’re in such handy little packages). Try and get some good quality cheese that will be more tasty, more nutrient rich and just generally better for you. Cube up some feta and throw in some cherry tomatoes or olives and that’s quite a nutritious and filling snack. Carbs are a necessary requirement for running. When training for a marathon, a low carb diet is probably not the best approach unless your body is really used to this way of exercising. Your body needs fuel and carbs are the easiest and simplest fuel for your body to use. You do want your body to tap into your fat reserves as well but within reason. I’d avoid crisps purely because they’re not that filling and they’re likely to spike your sugar levels and leave you wanting more. Aim for low GI (more complex) carbs that will digest slowly and leave you feeling full and satisfied. Fruit (banana is obviously a great choice here but obviously I’m going to say apples are the best). Vegetables, such as carrots. I don’t need to convince you veg is good for you. Pretzels – a nice salty snack that’s more filling than crisps and really moreish. Popcorn – a great snack as long as you avoid the sugary ones. A great source of fibre as well which is key for a good working gut and digestive system. Toast – a slice of wholemeal toast can be exactly what the body needs. Add some jam and have before a run and you’ve got a great source of fast and slow releasing energy. Or peanut butter for a more sustaining snack. Life is too short to not enjoy food! Have that slice of cake or bar of chocolate, just don’t have it every day “because I’m training”. I will always have a naughty snack/cheat meal/whatever the hell you want to call it at the weekend because though my body might not need it, my mind and soul does. My ethos is that I generally try and save a big treat until the weekend so I can fully enjoy it rather than some shop-bought cakes or biscuits someone from work has that I eat because I’m bored. I want to go out to a nice restaurant and eat a nice meal with people I enjoy being around. I make it into something that can be fully immersed into and enjoyed. Like afternoon tea or enjoying some home-baked cake from my friend. If you’re feeling tired and worn out, generally it can be one of two things: you’re not getting enough quality sleep or you’re not eating enough. Your body needs fuel and recovery. Sleep and food are two very simple easy ways to make running easier (IN THEORY – busy mums all over the world don’t shoot me!). If you’re not looking to gain weight, eat as much as you possibly can to maintain your weight with your training. Don’t skimp on calories, dive into those bad boys. And if you start gaining weight? Drop it your calories down a bit. Better to gain a little weight in the process of good running than burn out because you’re not eating enough. I’m not saying to suddenly count your calories and become obsessed over it, but just be mindful of what you’re putting in to get the best out. Do you lose weight or gain weight when training for a marathon? Do you graze through the day or stick to bigger meals? Hello! I’ve been missing in action this week because I’ve just had quite a few things going on..courses, moving house (which I’m doing tomorrow, argh) etc. Anyway, I have a review for you guys for a neat little protein drink sent to me by the ProBikeKit website. I’ve previously done a review for them before and I was happy to do another as they’re a great company. They have a cool site with lots of cycling-specific gear but also running as well, and a great selection of nutritional items. I was sent some Science in Sport (SIS) Rego Rapid Recovery protein powder specifically designed for endurance athletes. There are obviously loads and loads of protein drinks out there but usually they’ll be more protein-heavy, whereas this baby has a nice balance of protein and carbs which is ideal for when you’ve done cardio, like running or cycling, rather than post lifting weights. The idea behind this is that you take it 30 minutes after you’ve exercised and it provides your body with high levels of easily digestible protein and carbohydrates in order to accelerate your recovery. It was developed with Chris Boardman’s, the Olympic cyclists, input and feedback which is quite cool! There are four different flavours available: vanilla, banana, strawberry and chocolate. I chose the chocolate flavour as it was a no brainer for me. You mix one scoop (50g) of the powder with water. Interestingly, unlike regular protein powders, you only mix the powder with water, not milk. It advises that if you mix it with milk it will slow down the absorption process. Though the ingredients list is quite long… But it is suitable for vegetarians. Thoughts? I was really wary of the fact that it’s just mixing with water… I thought this would make it taste watery and not very nice. But I was pleasantly surprised! Don’t get me wrong, it’s not Nestle chocolate milk but it’s not unpleasant. I quite enjoyed it. For me it was a problem-solver for when I run after work and then have a long commute home – basically a long time before I get any proper food. It’ll be really handy after races as well, when I find hours go by before I get any decent food in me. I’m really happy to continue to use this, especially with marathon training cropping up soon and the fact that I’m still loving lifting weights at the gym. I don’t want my body to suddenly start eating away at the muscle I’ve strived to build over the past few weeks. Check out ProBikeKit’s website for more cool nutritional products like gels, protein bars and drink mixes, etc. Have you tried any of the SIS products? Do you take any protein powders? What do you have post workout? Morning, morning. I am pleased to say that I am back in the marathon running game! OK to be fair (and I imagine you’re used to this now if you’re a long-time reader) I was probably being my usual paranoid runner self about my shin…which actually worked in my favour as I was very cautious and didn’t do my 16 miler long run, nor my Tuesday run. So by Thursday my shin had calmed down hugely and felt absolutely fine. I think the moral of the story for me is not to go crazy with calf raises and tighten up my calf. Oh, and rest is best! This meant I could join in with a club-organised long run at the weekend, happy days! A few of us decided to make things interesting by doing 17 miles and then doing a parkrun to top it up to 20 miles. The appeal was a faster finish long run, a nice way to break up an otherwise laborious load of miles and also to get in some parkrun tourism. Most of us had never been to Winchester parkrun (which is about 30 minutes away) so it was quite nice to do something different. The downside, however, was realising that to get the miles in before parkrun meant a very early start. 5.15am alarm for Saturday morning… ooof. This meant Friday night was technically a school night with sensible food and an early night. I made sure to lay my things out the night before ready to make it easy in the morning. I slept so badly as I kept panicking about my alarm and just generally feeling nervous about the run. I woke up at 4.30am and was pleased that I had another 45 minutes to sleep. But then a while later I jolted awake thinking I’d missed my alarm. Well, my alarm was going off all right but it was on silent!! I was so lucky that it was only 5.20am. All thoughts of how tired I felt were gone as I leapt out of bed and got ready in a panic thinking I’d be late. I ate a Trek (Original Oat) protein bar as I walked Alfiea fter I got dressed. Probably not a great idea as it was so crumbly and it was so dark outside I was getting it everywhere. I had the world’s smallest coffee and was good to go! Despite my late getting up, I arrived at the local train station before everyone else. The plan was to leave our cars there, run to Winchester, eat something, then get the train back to our cars. We were going to meet another friend, Matt, half way there as he thought it best to not run the entire 20 miles as he was recovering from the dreaded plantar fasciitis, and then we’d meet another friend, Kate, at the parkrun as she was running a half marathon the next day. The route was lovely! All along Itchen River and a fair bit off the main road – which is such a relief when running so many miles. Though it did rain on and off, it was a lovely temperature. I really enjoyed chatting away to the guys as we ran – the time flew by. I do like doing long runs on my own when I zone out and listen to podcasts, but there is something truly enjoyable about running with others, especially for such a long way. Long runs can get very lonely. We made it to Winchester parkrun with about five minutes to spare which was cutting it close. I didn’t want to have to run again after the parkrun and was about 0.5 away from 17 miles so did a lap around the course just before we started. This helped minimise the break between the two runs as well. Winchester parkrun is very flat and is basically three laps around a field – though apparently we did a slight variation of the usual course doing a weird diagonal run across a field. My first mile was a bit panicked and rushed because after they finished the briefing I thought we’d be starting somewhere else but the guy just said “get ready, go!” and I realised I was quite far at the back and had to do a lot of over-taking and dodging around people. I did have a chuckle though when I saw a man who was running with a dog get yanked back as the dog decided to do his business there and then come what may. The guy had to stop and pick up the poo…a parkrun poo, tee hee. The second lap was tough. My legs felt very heavy and it just felt hard. My pace dropped and I felt myself flagging. The third mile was easier because I knew it was the last, but my legs (understandably) still felt tired. I got 23:29 which I was over the moon with though. But it did make me think long and hard about what I could achieve at Bournemouth. I just don’t feel mentally ready to push the pace at that marathon and I don’t think my training as been as good as Liverpool had been. I also don’t feel the hunger to get a faster time like I did with Liverpool and I really don’t want to put pressure on myself and potentially have a horrible experience. We all agreed that it was a tough parkrun because of the miles beforehand but were really proud of ourselves. And though Kate didn’t run the 20 miles, she still smashed out a great parkrun and got first lady! So we all felt pretty chuffed. 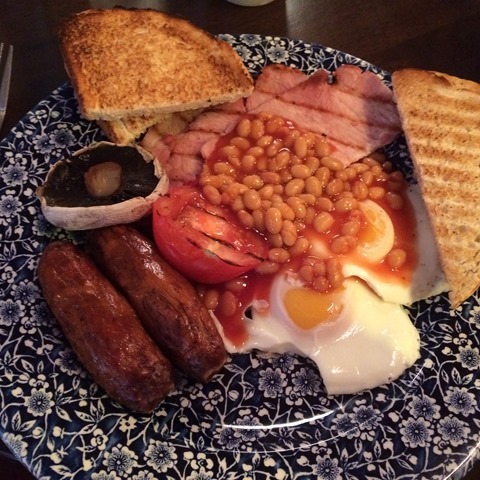 Then it was off to Whetherspoons for breakfast. We all sort of stumbled there slowly and collapsed at a table. Most of us had a fry-up. I went for the large fry-up but subbed my hash browns for more bacon (a superior swap I think). It was delicious! I also ordered a diet coke, a glass of water and a coffee. Hitting all bases. We got a lift back with Kate which was great as well. I’m so pleased how well the run went. It was definitely the confident boost I needed for the marathon. Though I ran Cheddar Gorge marathon recently, it was still a good few weeks past now and having missed last week’s long run I was feeling a little worried. But during the 20 miles I felt strong and like I could have gone on and on. The pace was slower than my usual long run which is probably a good thing as 20 miles at my usual pace would probably make the next few weeks hard in terms of recovering and being fresh. Though I’m happy I got to pick the pace up at the end to push through. After getting back I had this mad surge of energy. Instead of usually feeling exhausted I was on fire with housework, walking Alfie and getting stuff done. Though I didn’t feel hungry again until 4pm! (To be fair, that breakfast was HUGE so I’m not surprised). The next day I decided to have a rest day. My legs felt good, no niggles or twinges, but I felt a general sense of tiredness. Remembering how injury-prone I am and that I’m not the fastest at recovering, I thought it best to forgo any exercise other than some lovely long walks with Alfie. <– Can we just marvel out how sensible that sentence is for me. I’ve come a long way! Later on I saw Ben’s mum again this weekend for afternoon tea. We were meant to do afternoon tea last weekend but we left it too late so we decided to try again. We headed to a place I’ve been before but not for a while, Lilly’s in Wickham. We both went for a slice of red velvet cake, a fruit scone with jam and cream and I had ham and onion marmalade sandwiches. It was divine. Though I do prefer to have crusts on my sandwiches they were very dainty! So all in all, a pretty good weekend. Cake and running – things are back to my kind of normal 😉 And now time to taper! What’s your ideal long run? A training run at a race, running solo, running with others? Crust or no crusts on your sandwiches?